Event Archive: Learn about some of our past events! Be sure to check out our Facebook page to see photos from our many events this summer! 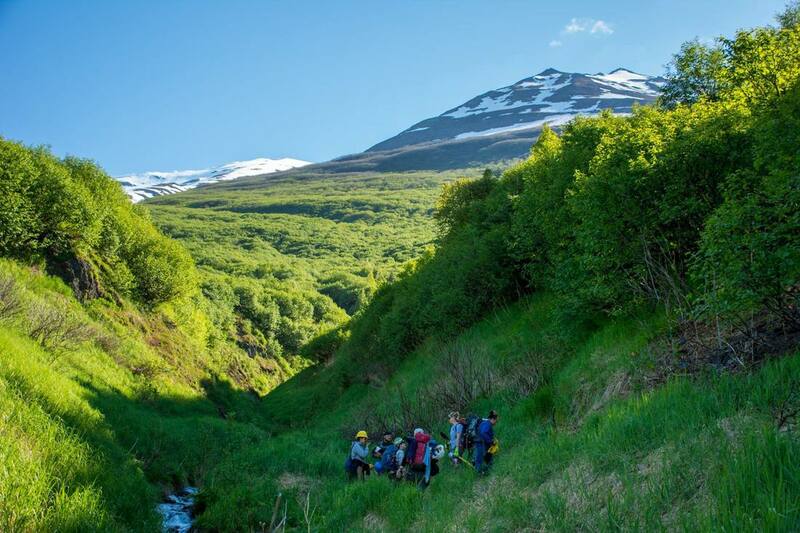 June 9, 2018 Stewardship Event On June 9th, Alaska Trails hosted a trail building day on a 1.5 mile stretch of trail between Rocky Creek and Victor Creek, on the Chugach National Forest near Moose Pass. This trail is yet to be finished, but stay tuned to hear about other trails you can visit right now that were once used by mushers as a part of the Iditarod NHT system! 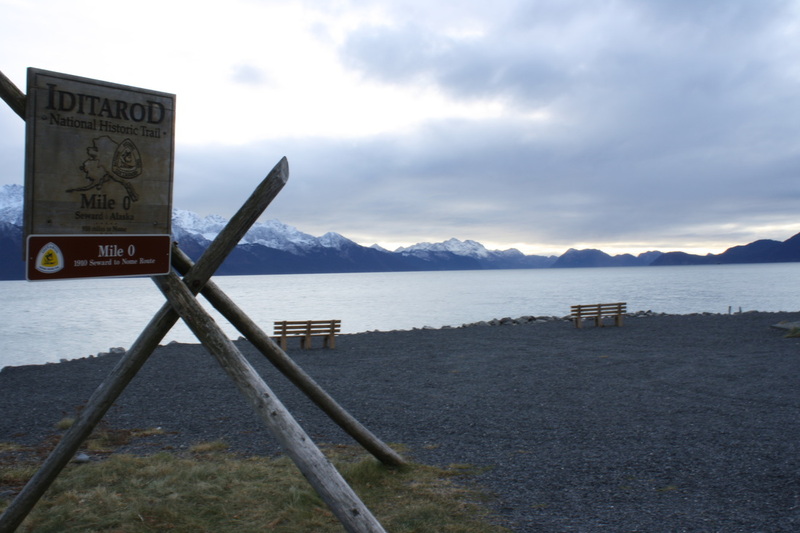 June 3, 2018 National Trails Day Trail supports gathered at Mile Zero of the Iditarod National Historic Trail in Seward, Alaska for the annual National Trails Day celebration! Information was provided about the Seward Iditarod Trail Blazers and the Iditarod Historic Trail Alliance, there was a trivia contest, a BBQ - and Smokey Bear even made a guest appearance! Thank you to everyone that attended! 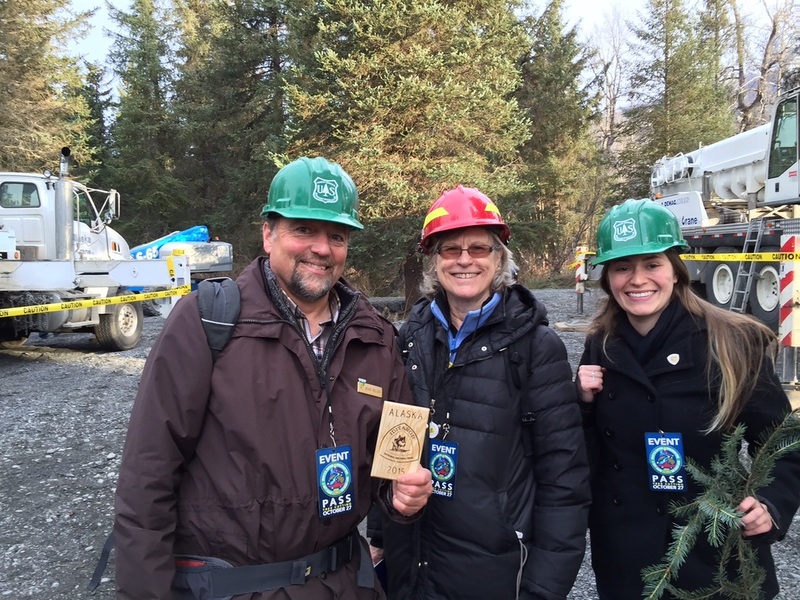 March 11, 2017 IditaZoo Read about our participation in the Alaska Zoo's IditaZoo event on our blog! ​January 28, 2017 Winter Trails Day The Iditarod Historic Trail Alliance was happy to participate in the resurgence of Winter Trails Day at the Campbell Creek Science Center! Volunteer Caitlan Dowling with a snowman. June 4, 2016 National Trails Day On the first Saturday in June, the Seward Iditarod Trail Blazers joined organizations across the country in hosting an event for National Trails Day! Rain didn’t keep 21 members of the public, including a couple that had just sailed across the Pacific Ocean to Resurrection Bay, from joining Alliance Board Member Lee Poleske in a guided walking tour. 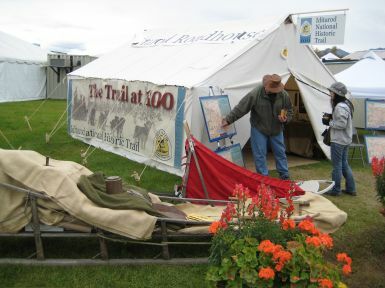 They covered important events in Seward's history that have taken place along the first mile of the Iditarod National Historic Trail, such as: the building of the Phoenix in 1794, the first ship built by the Russians in Alaska, the first settlers in the Seward area, the Lowell family in 1884, the founding of Seward in 1903, the history of the Iditarod Trail, the building of the Alaska Railroad, the effects of the 1964 Alaska Earthquake along the Trail area and other historic events. March 6, 2016 Iditarod Sled Dog Race Restart For the first time, the Iditarod Historic Trail Alliance had a booth at the Willow Community Center during the Sled Dog Race Restart on Willow Lake - and we already can't wait for next year! A huge number of people stopped by, and some were excited to learn that the trail is also a National Historic Trail, while others had wonderful stories of already visiting Mile 0 in Seward! February 25 & 26, 2016 Fat Bike Expo This year's inguinal Expo out a huge crowd of fat bikers, Fur Rondy goers, and history buffs alike! Set in the Egan Center, visitors got to learn about the latest in Fat Bike Technology- and the Iditarod National Historic Trail! The context of the trail was especially meaningful to the bikers that were about to set off on the Iditarod Trail Invitational, the 350 mile bike race to McGrath! Happy trails to all the riders and visitors alike! 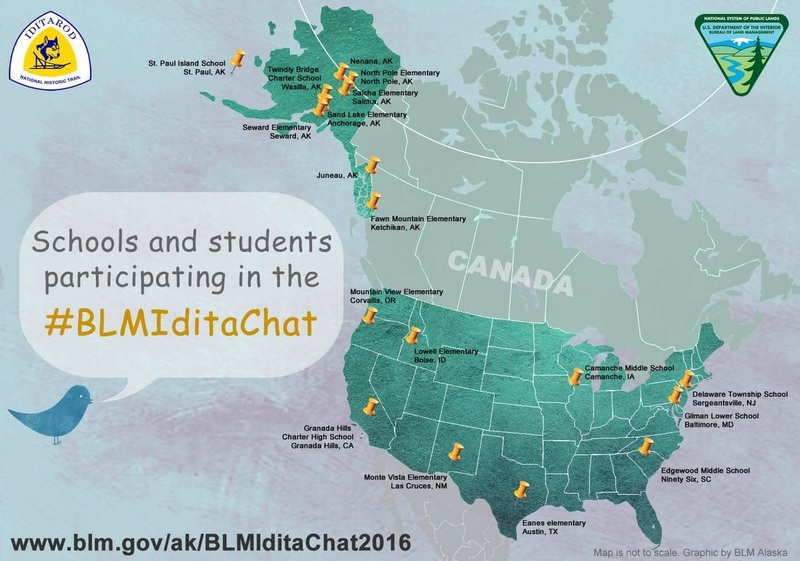 BLM #Iditachat 2016 was a great success! Check out all of the great questions and answers! A shot of Mile 0 in Seward, Alaska from a clearer day. President Judy Bittner at the Alliance booth. 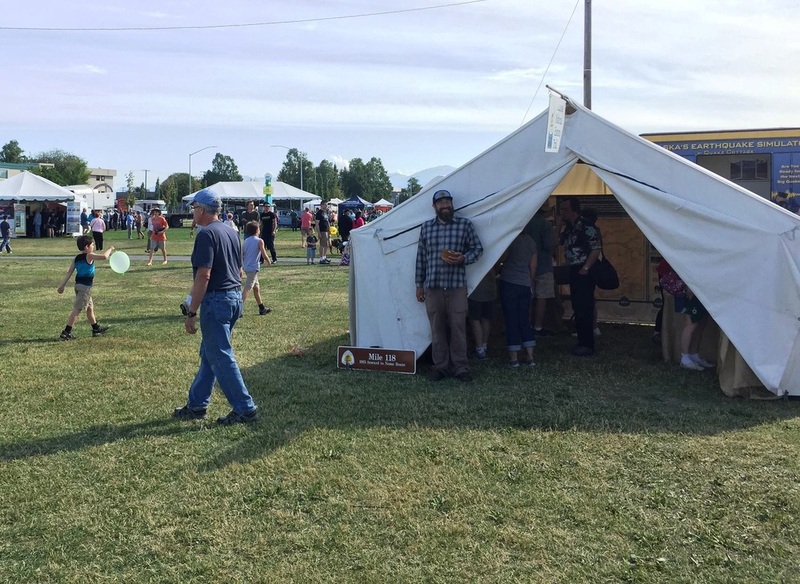 July 25-26, 2015 Anchorage Chamber of Commerce Tent City In honor of Anchorage's Centennial, a Tent City fair was hosted on the Delaney Park Strip in Downtown Anchorage. 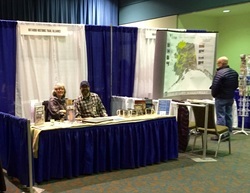 The Iditarod Historic Trail Alliance was there with our Iditarod Roadhouse! Even through the rain, the Roadhouse was busy throughout the weekend as visitors took a break from the funnel cake and learned about the Iditarod Historic Trail, shopped our new products, and even got an Iditarod logo temporary tattoo! July 1, 2014 Stamp Event The BLM has been working to develop a stamp plan for the trail to participate in the Passport to Your National Park program. Starting with National Park visitor centers, public lands across the country frequently have a stamp with their location that visitors can stamp their passport with the date of their visit. The Iditarod received its first stamp at a special ceremony at the Alaska Public Lands Information Center in the summer of 2014. 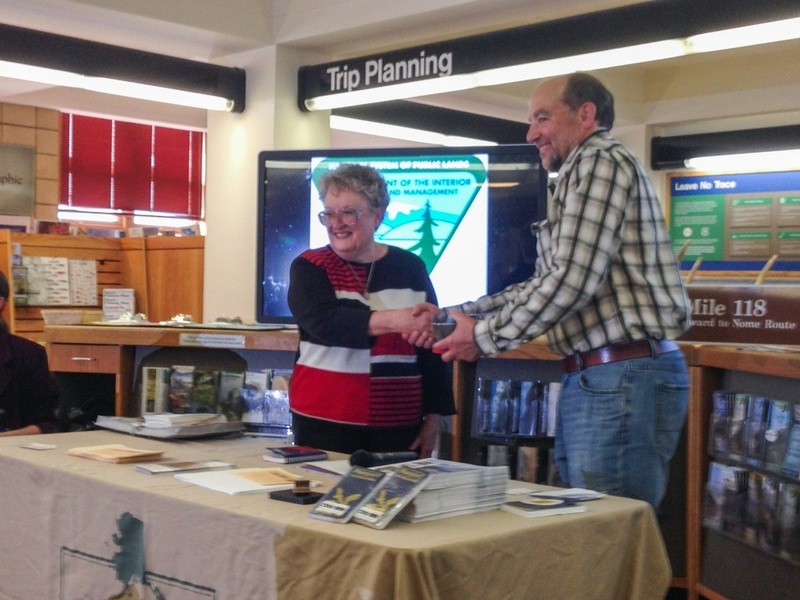 The National Park Travelers Club visited Alaska as a part of their yearly conference, and presented the BLM Trail Administrator Kevin Keeler with their first official cancellation stamp. This stamp now resides at the BLM Campbell Tract Facility. Learn more about the Iditarod National Historic Trail's Passport Stamp Program here! 2008 - 2014 State Fair Come on down to the Iditarod Roadhouse! From 2008 - 2014 the Alliance hosted the Iditarod Roadhouse, a place where kids and adults alike could learn about the trail, make an art project, and snag one of the highly coveted Iditarod zipper pulls! In 2014, the Roadhouse highlighted the 100th anniversary of Colonel H. E. Revel receiving the first contract to run the mail to Iditarod from Seward along the trail. Check out more information from the BLM!